It’s becoming more and more common to go on vacation to clear your head and make the most of every moment with your family. 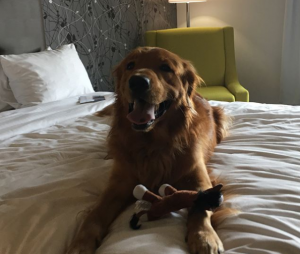 You often don’t need to go far or hop on a plane to get away from the daily grind and spend some quality time with your family, friends, better half… and also your pooch! We visit the province of Québec’s beautiful regions, each more unique than the next. We discover local products, sample dishes that have been reinvented by talented chefs and even rediscover our favourite spots from all around the province. More and more, we even travel with our dogs because – let’s face it – he’s part of the family and it’s almost unthinkable to leave him behind. 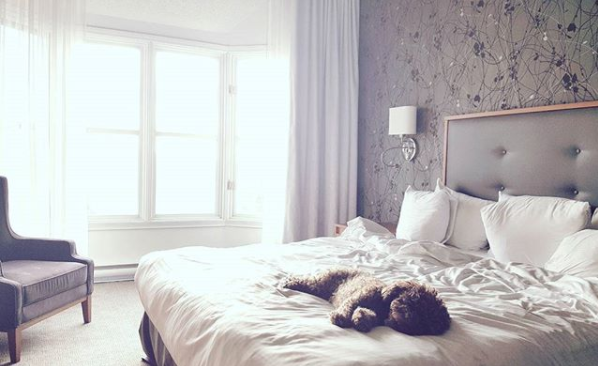 If this wasn’t the case a few years ago, many establishment now welcome 4-legged guests in Québec, and Domaine Château-Bromont is one of them. That’s right: the Domaine is a pet-friendly establishment! 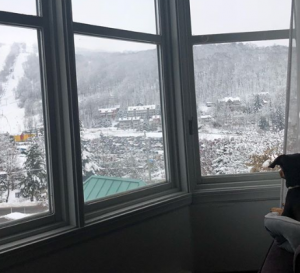 Here are come tips to keep in mind before and during your stay when you choose to bring your fur baby with you at Domaine Château-Bromont. 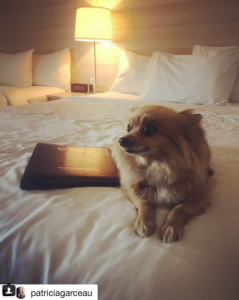 It’s important to let the hotel staff know at the time of your reservation that your furry friend will be tagging along. Like it is the case for many establishments, not all rooms can welcome dogs. We want to avoid any inconvenience if a guest that’s allergic to dogs is the next one to occupy the room. 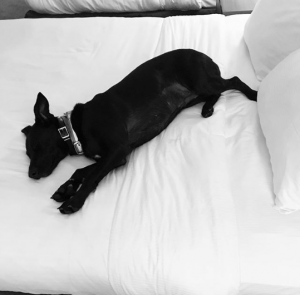 We charge cleaning fees when a dog stays in the room with you. Even though we love them, and whether they weigh 5 or 25 pounds, dogs shed. A fixed charge of $50 for cleaning and maintenance of your room will apply for the length of your stay. To be respectful of other guests, the Domaine asks that your dog not be let in the room alone if he’s not in a cage. New environments can be stressful for pets and we want to avoid any accidents from happening while you’re away from your room. Helpful tip: If your dog likes people and you don’t mind leaving him with a pet sitter, or if you can’t leave him in a cage, we can provide you a list of pet sitting services available. These are three thnings you need to be aware of when visiting the Domaine with your pooch. By following these, you can help ensure that you’ll enjoy a relaxing stay with the ENTIRE family, without leaving anyone behind. You’re planning a stay with us and have other questions? Don’t hesitate to contact us by email at info@chateaubromont.com or by phone at 1 888.276.6668. We can’t wait to welcome you and your pooch!